Over the years I've had many favourite books, like I'm sure we've all had, and in the future I hope to have many more. Growing up, my favourite books changed a lot. From books like Spot and The Zoo, to the Famous Five and The Magic Faraway Tree, to the Edgewood Chronicles and A Series of Unfortunate Events, to The Hobbit and Eragon...and then my favourites more recently. And I still love all these books, but I remember absolutely loving Inkheart, by Cornelia Funke, both when I read it, and years after. I won't say too much more, but I will tell you that it is a fantastic book, whether you're a fantasy lover or not. It's a story within a story, and the characters are so creative and extreme that they draw you in even more with every page. There are baddies and goodies, sadness and joy, and a whole heap of awesome. 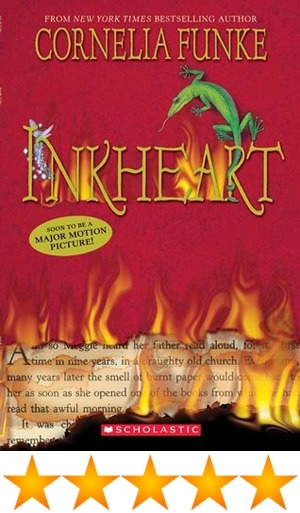 It was first published in 2003, and since then, Funke has written 3 more books as sequels to Inkheart. I have to be honest, I haven't read them yet, but I'm sure they are just as amazing. There is also a movie that came out in 2008, which I haven't seen. I've heard mixed reviews about the movie...but if this sounds interesting to you, please please please start with the book.